UPDATE: Eagle Scout Project has been completed! Thank you to Jack, Sam, and Ben Frye! See the below photos of the completed projects. The highest ranking achievement of a Boy Scout is becoming an Eagle Scout. Attaining this rank is not an easy task. In fact, since the inception of the Eagle Scout award in 1912, only 2% of eligible Scouts have earned Scouting’s highest honor, according to Boy Scouts of America. Earning 21 merit badges and being responsible for a community service project, are just two of a long list of requirements to become an Eagle Scout. 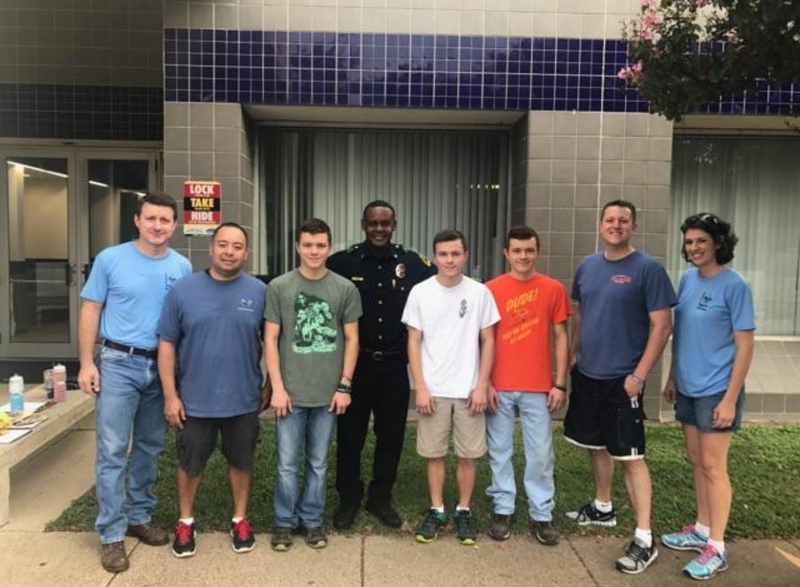 Three brothers, Jack, Sam, and Ben Frye who live in the northeast area of Dallas, have chosen the Northeast Patrol Division to do their community service project in hopes to ascend to Eagle Scout. Each sibling led three separate projects with the help of the their parents, close friends, and of course the department’s Northeast Neighborhood Patrol Officers. Home Depot has graciously assisted the trio by generously donating the supplies and project coordinators to complete the job. The three projects consist of a new flower bed to beautify the front of the patrol station, placing a hoop and re-striping the basketball court for recreation, and resurfacing the inside counter tops for administrative duties and perhaps to set a cup of coffee. The brothers began the project on August 26, 2017, and weather permitting, expects to have it completed by September 5, 2017. Major Moore, who commands the Northeast Patrol Division, cannot thank the Frye brothers enough for their initiative in helping to enhance the sub-station. Good luck future Eagle Scouts. Please be sure to look for updates and photos of the completed project!